Home > Shop By Brand > BLACKFIRE Pro Detailers Choice Car Care Products > BLACKFIRE Instant Detailer 128 oz. Recharge that WHIPLASH-inducing shine instantly! BLACKFIRE Instant Detail is a supercharged blend of Ivory Carnuaba Wax, Wet Diamond polymers, and high lubricity cleaners. This shine-boosting detail spray instantly revives a dull finish and reactivates existing wax. BLACKFIRE Instant Detailer looks best over Midnight Sun Paste Wax but it is compatible with all waxes. Use this incredible spray to maintain BLACKFIRE's trademark “Wet Ice Over Fire” shine or over your favorite wax or sealant. The shimmer of fresh wax fades quickly, even though the wax is still there. Dust and dirt settle on the paint while bugs and birds do their parts to diminish the shine. What you need is a way to recharge the existing wax and renew the gloss. You need BLACKFIRE Instant Detailer! BLACKFIRE Instant Detailer is a high lubricity spray that loosens dust and light contamination so it wipes away without scratching. High gloss Wet Diamond polymers bond to the existing wax to breathe new life into it. Ivory Carnauba wax intensifies the liquid shimmer. In an instant, the paint looks shinier, deeper, and more reflective. 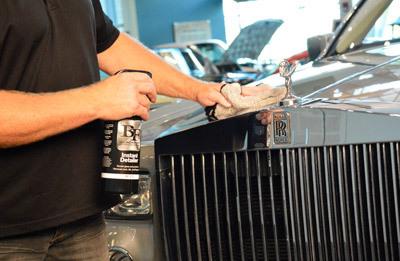 BLACKFIRE Instant Detailer refreshes the shine of auto paint instantly! You can use BLACKFIRE Instant Detailer to remove dust, dirt, fingerprints, smudges, as well as fresh bugs and bird droppings. It is safe on paint, clear coats, exterior plastic trim, and chrome. Use a microfiber towel with a deep nap for the best results. BLACKFIRE Instant Detailer buffs out easily and leaves a streak-free shine, even on dark colors. BLACKFIRE Instant Detailer is made to complement BLACKFIRE Midnight Sun Paste Wax, but it can be used over any car wax without smearing or clouding. Enjoy the satisfaction of a just-waxed vehicle any time, instantly! BLACKFIRE Instant Detailer gives wax the boost it needs to go the distance. High lubricity formula helps prevent scratches. Restores the shine and protection of Midnight Sun Paste Wax. Safe and effective on paint, clear coats, exterior plastic trim, and chrome. Removes light dust, dirt and fingerprints to maintain a just-detailed look. Shake well. Mist one panel at a time and use a soft, clean microfiber towel to wipe off dust and dirt. Flip the towel and buff to a deep shine. Cleans light dust without hurting paint. Doesnâ€™t streak and boosts the shine of the wax. Others I have to go over again and again to remove streaks. This one just kind of melts into the paint seamlessly. I have been very happy with the results from this product. It's the first time I've tried it. Compared to Maguire's and Poor Boys, it leaves a better shine. Smells great too. I've used Meguiars Ultimate Quick Detailing spray for years and loved it. The Blackfire Midnight Sun Detailer is even better. It makes my black 2010 Camaro's paint even darker and deeper. Five stars all the way! I purchased a smaller container and was very pleased. So, when the chance to buy a gallon at a good price came up; I bought it. This "Midnight Sun ID" by Blackfire releases the micro-bits clinging to the paint and buffs-out to a brilliant shine with no effort. I try to dust my Miata every day and keep it in the garage whenever it's home. It gets out for a bit over 600 mi./mo. and I can go for weeks without washing it and always get compliments about how good it looks. ProsRestores a brilliant shine and leaves paint smooth as plastic.